Are you living or dying? Well, if you believe in the social construct of race, then your life is a slow yet acceptable death. At birth, we are told that we are socially colored black/ white/ red/ yellow/ brown/ beige, that this is the way things are so we might as well get used to it. Get use to being stereotyped and pre- judged. Welcome to the world! Now, go ahead and die: die to your divinely inspired self, kill your dreams and aspirations– because race says so. Because you are socially colored black/ white/ red/ yellow/ brown/ beige, this is what you are allowed, expected and limited to doing, being and believing about yourself (and other cultural groups). Race tells us who we are; it does not assist us in our becoming. Instead, race stunts our growth and stops any conversation that centers around the divine gifts that God has created us to be. Race says that we are a problem to be solved, fixed, eliminated. But, God says that you are a gift to be celebrated, opened and appreciated. And you are not even a new problem but more of the same old problem we’ve had with “those people.” No, we have nothing new to contribute; our life is nothing special. We are just like “them,” more of the same stereotypical human beings. Race tells us to join the crowd, to stand behind the color line like the rest of them. Race says that we must jump into a box so that it can check us off. Our becoming in terms of race is then finished. Some say, “Things will never change” but I am not a thing. I am a new creature in Christ and am being changed (Second Corinthians 5.17). Others say, “That’s just the way it is” but that sounds like a eulogy. I am not dead but alive. Stop the funeral procession! I am still moving, still growing, still able to impact the world– even if it’s only my own. 1. We prepare our lives for the worst. Race tells us that simply because we exist, bad things will happen, that people will believe bad things about us, that we are bad people who do bad things. 2. We believe there is no hope. Convinced that because we cannot change the social coloring of our skin that we are stuck in a particular social condition, we do not aspire to live beyond the stereotypes or to think outside of racial prejudice. 3. We agree with race and deny our true selves the right to speak. 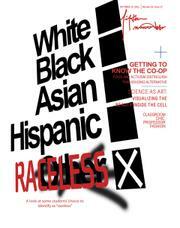 We take the word of race over our own and will quiet our dreams out of respect for the prejudices of race. We want even allow our hearts to speak. Unfortunately, we believe more in race than our selves. We believe more in our socially constructed race than the Divine image in which we were created and in so doing, race slowly kills us, by telling us who has been and not who we are. “Those conflicts and disputes among you, where do they come from? Do they not come from your cravings that are at war within you? We know that we are not physically colored black/ white/ red/ yellow/ brown/ beige, that we are apart of one long social and pseudo- scientific experiment based on the self- serving theory that one group of human beings is better and greater than all others; consequently, needing all of the earth for themselves. We agree that race is a sociocultural construct, that there is not a single shred of biological evidence that would support such a belief system, that the practice of genocide, oppression and enslavement are never justified or excusable but are demonstrations of our sinful nature. We believe that there is no reason, no rationale that can be given as to why all of God’s creation can not live on the earth without the threat of harassment or molestation just for simply and naturally being. But, that does not matter. This on- going war is about hurt and pain, not just who hit first but whose hurt will last and land them on top of the heap, a modern attempt at being the king/queen of the hill. There is no denying that we have all been hurt and that we have all hurt others– if only in our hearts (Matthew 5.27-28). And before we can be personally touched by the prejudices of others, we inherit the experiences and expectations of parents, teachers, friends and Christian leaders. We strangely and eagerly pass it on: Get ready for the race war! You will be attacked so it is best that you strike first. They are out to get you so be aware and beware. Stick with each other. Don’t forget where you come from. Remember your history. Or, be quiet. Get down. Stay out of it. Don’t get involved. They have nothing to do with us. This is none of our business. Don’t talk to them. Don’t make friends with them. This is the language of the race war. These are fighting words. We have all been enlisted in this race war. Our parents made this decision before conception that we would be a part of the fight, that we would need to be on the “right side of history.” But what are we fighting for now? Who are we fighting against now and for how long? And what of all this present time? Must I give it all up in service to history? Will there ever be a time of reconciliation? Will we always hate each other? Is there no place to put down our prejudices, to lay aside our resentments, to forget or forgive? The answer is yes, always, anytime and anywhere yes. Our belief in race and practice of racism persists because we crave power and more so, power over others. We want all of the attention because inside, we feel that we do not matter, that we are powerless. We treat others as if they are invisible because we do not feel that we have been seen. We push persons to the margins because it the place that we are most familiar with. We have been there. We can only treat people as we have been treated. The truth is that this war is really not about race at all. It is a collection of fights that we are all having with ourselves. This race war begins and ends with us. We must change our internal desires, our cravings for ourselves and in so doing, we will change our treatment of others. When we get tired of fighting against our true ourselves, we will stop fighting others. I, for one, am tired. 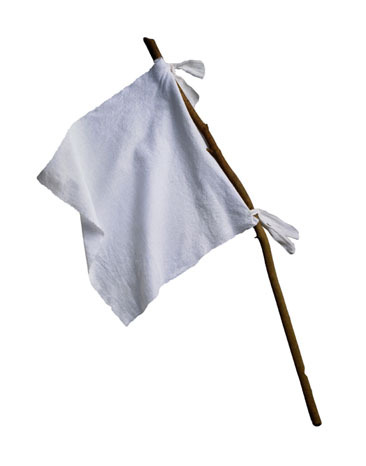 I am laying my weapons down and picking up a white flag of surrender this morning. Will you join me? At The Daily Race, we believe that a life lived without race is a life lived more fully in Jesus Christ. All social categories, classes and colors cease to exist; they are without meaning and merit as we are being transformed into the image of Jesus Christ. We stand in agreement with the words of Paul as recorded in his letter to the church at Galatia: “There is no Jew or Greek, slave or free, male or female; for you are all one in Christ Jesus” (3.28) and to the believers in Colossae: “Here, there is not Greek and Jew, circumcision an uncircumcision, barbarian, Scythian, slave and free; but Christ is all and in all” (3.11). The race-less life seeks to ensure that we are no longer divided against ourselves, our God and our neighbor. Emphasizing the spiritual life and our renewal in the Spirit, our only position is in Jesus Christ (Ephesians 1.1-14; 4.22-24). The race-less life unites us more fully with Jesus Christ and with other believers as race seeks to prevent the reconciling work of Jesus Christ. The race-less life then challenges the self- imposed and cultural boundaries constructed with stereotypes and prejudices and the authority of race to create and enforce them. We believe that the Body of Christ is not segregated just as the members of our physical body cannot be separated. As God is reconciling us to Himself through the salvific work of Jesus Christ on the cross, we are also being reconciled to each other (John 17.11, 20-23; Ephesians 2.11-22).